Ipharra was born to unite simultaneous objectives assembled in Ipharra creator’s vision, a sailing catamaran offering the maximum comfort and security to be shared in three ways: exclusive charters, adventure and training cruises and private use. 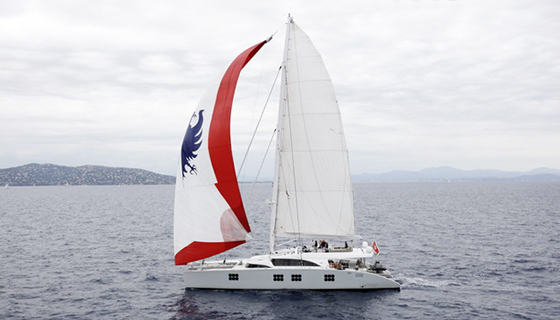 Ipharra, 102 feet, is one of the largest cruising catamarans of the world. She is also the first sailing catamaran in the world from a Double Deck line, and the third biggest sloop rigged catamaran of the world. This super yacht catamaran is built with an aluminium hull and with her 42ft beam, offers guest unrivaled space and comfort and can accommodate up to twelve guests in five spacious cabins. Ipharra has been designed to operate for long periods, in all weather conditions and to be run by a crew of five. She makes the best use of modern technology. Safety, economy, sea worthiness, and attention to detail have all been a prime consideration during her two year building process. She is Bureau Veritas classified and build under the MCA rules. Three guest cabins are equipped with king size beds (one or two beds according to your wishes), one cabin with queen size bed and one with twin beds. All have fantastic view on see and en-suite bathroom. The Master suite is positioned to comfortably accommodate guests who have mobility challenges. Ipharra is a luxury catamaran thought for comfort and relaxation in style. • In the always shaded cockpit, you can enjoy a large table to ensure comfortable “alfresco” dining and relaxing moments for up to sixteen guests ; a long & large sofa with the eight-meter long mattresses and soft pillows covers the tender garage and provides a resting area after an active day spent in the sun. Choose you movies from the onboard DVD library and watch them on the exclusive outdoor home cinema while listening to the sea. • Three steps down the main deck, on the lower level, there is a beam wide helm station and dining area. The stunning panorama can be enjoyed while navigating, as panoramic window covers the upper forward section. On the right there is a high conference table/chart table with a display screen purpose-installed for business meetings and video conferences. The opposite side of the lower deck is occupied by a dining table with high chairs for up to twelve people. • The bow nets area is one of the favorite areas for guests to enjoy having a cocktail or lying on the nets and sunbathing. When you lie down in this area, only the net separates you from the sea water, making it very pleasant to have a nap. • On the 50m² flybridge sundeck, accessible via a set of spiral stairs from the cockpit, are the main navigation station, all sails maneuvering, a bar and dining area for twelve people, and lots of deck chairs and armchairs. A great place to sunbathe and enjoy the sea. • In the midship section, there is a fully equipped kitchen with a four induction burner, gas oven, electric oven with grill function, extractor fan, side-by-side full size fridges and freezer, microwave, trash compactor, wine cellar, ice maker, large “industrial” dishwasher as well as the crew saloon featuring a dining table, seating, TV and laundry. The concept of Ipharra came from the mind of the owner; after having chartered two- or three-dozen different yachts all around the world over the last 20 years, he clearly understood and visualized how his dream boat would be. He chose a sailboat rather than a motor yacht because of both the real and symbolic power of sails to convey those aboard to another place and time. 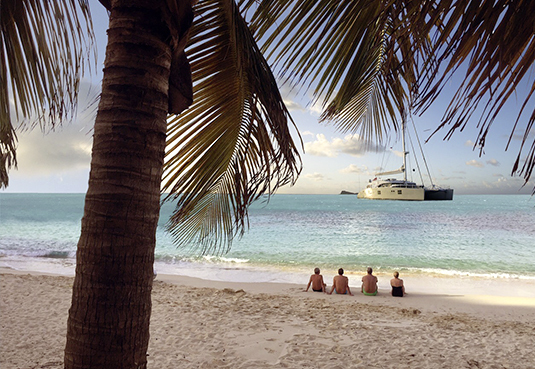 “Sailing really brings you to another world and provides something magical,” he says. The interior style is a combination between modern and classical elements of decoration. Beside Wenge and Anegre woods, different types of skai are applied on the walls and ceilings, all in beige, ivory and cream creating harmony and balance for the carefully designed interiors. Ipharra comes as a stylish and elegant vessel not losing anything of her pragmatic side. The owner didn’t want anything that looked like it was showing off; he wanted the yacht connoisseurs to recognize that the Ipharra represents a concept: she’s firstly very comfortable and very livable – and is constructed to a very high quality. Ipharra was not designed to be commercially viable, it was the expression of his emotion that Sunreef under his guidance and advice transformed in a sailing dream, where family, friends and students came together in a place of discovery. Interior and exterior Bose sound system.